Upper Cretaceous strata of the Western Interior region were first divided by Hall and Meek (1856) who recognized five major lithologic units that were numbered from one through five in upward order. Meek and Hayden (1861, p. 419) gave these units the geographic names Dakota, Fort Benton, Niobrara, Pierre, and Fox Hills respectively. Strata discussed in the present report were formerly classed as part of the Fort Benton Group, a unit that enjoyed formal status at least until 1920 (Moore, p. 83) but which was no longer used officially in Kansas at the time Rubey and Bass (1925) published their now-classic report on the geology of Russell County. 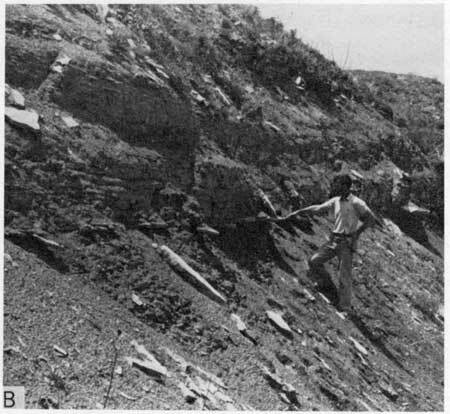 The Benton Group included rocks now, as then, referred to as the (ascending) Graneros Shale, Greenhorn Limestone, and Carlile Shale. Detailed studies of the Benton rocks in Kansas were slow to appear in print. In the first annual report on the geology of Kansas, Mudge (1866, p. 10) stated that the Cretaceous is "represented rather largely, but no definite examination has been made to show its extent, as it lies mostly beyond the settlements. Chalk is said to have been found in it." As late as 1875 Mudge (p. 111) reported "The Benton group appears also to be absent [from Kansas]; but as the upper part of the Dakota has few fossils, and is not well defined, there is a possibility that some traces of the Benton group may yet be detected.... Hostile Indians and an uninviting country have kept explorers from traversing the southwestern plains." Still later Mudge (1876, p. 219) reaffirmed his belief that Benton rocks are absent from Kansas, despite the fact that his report contains brief descriptions of limestone beds and shale beds that were later included in the Benton Group and that are now assigned to the Greenhorn and Carlile, respectively. However, this error stemmed from the identification as Niobrara some Inoceramus-filled chalky limestone at Wilson's Station (Wilson, Ellsworth County; brackets mine) by Hayden (1872, p. 67). [Note: In his "Sketch of the geological formations along the route of the Union Pacific Railway, Eastern Division" Hayden (1872, p. 67) recognized clearly the presence of Fort Benton shales along the bluff at Yocemento, five miles northwest of Hays, Kansas. Because the beds at Yocemento lie above the limestones exposed at Wilson's Station, Mudge concluded that the shales at Yocemento could not belong to the Fort Benton Group.] Within two years Mudge (1878, p. 64) had reversed his position and the existence of Benton rocks within the State was firmly established despite his inclusion within the group of the lower beds (Fort Hays Limestone Member) of the Niobrara. As late as 1887, however, beds now assigned to the Greenhorn were mistakenly identified as Niobrara by St. John (1887, p. 145, 146) whose errors are evident both in locality descriptions and stated thickness of the Benton interval in Hamilton County, Kansas. First to subdivide the Benton Group of Kansas was Cragin (1896, p. 49) who recognized (ascending) the Russell Formation; embracing the present Graneros Shale, Greenhorn Limestone, and Fairport Chalk Member of the Carlile Shale; and the Victoria Formation which included the present Blue Hill Shale and Codell Sandstone Members of the Carlile Shale. In establishing this classification Cragin correctly interpreted the genetic relationship of the Greenhorn and Fairport. Unfortunately, the formational separation of carbonate and noncarbonate strata at the Fairport-Blue Hill contact was not perpetuated by later workers. Beginnings of the present Greenhorn nomenclature in Kansas are seen in the work of Logan (1897, p. 215-219) who divided the Benton into two groups including "the lower, or limestone group, and the upper or shale group." In the upper group (Carlile Shale of later use), he included the Ostrea shales (Fairport of later usage) and Blue Hill shales. In the lower croup Logan (1897, p. 215) recognized "five principal horizons, namely: 1, Bituminous shale; 2, Lincoln Marble; 3, Flagstone; 4, Inoceramus; and 5, Fencepost." The bituminous shale is now known formally as the Graneros Shale (see Hattin, 1965a, for detailed description). The remaining units belong to the present Greenhorn Formation; however, from Logan's text one gathers the impression that these are "key" or "marker" units and collectively do not represent the entire thickness of the Greenhorn. The Lincoln Marble horizon (Logan, 1897, p. 216) apparently corresponds to the Lincoln Member of present usage, but Logan's description is totally inadequate. The Flagstone horizon was described as lying conformably between the Lincoln Marble and the Inoceramus horizon yet was stated to be only 10 feet thick. Actual thickness of the interval separating the Lincoln and beds I believe to represent Logan's Inoceramus horizon, ranges from 16 to 82 feet, the smaller figure representing an abnormally thin, condensed section in Jewell County (Loc. 20). Furthermore, his description of the Flagstone horizon seems to fit best the lower part of Jetmore Member of the present nomenclature, and his classification leaves beds of the Hartland member unaccounted for. The Inoceramus horizon seemingly represents the upper part of the Jetmore Member, including the Shellrock limestone bed, lying at the top of the member, and one or more of the Inoceramus-rich limestone beds that lie shortly beneath the Shellrock bed and project conspicuously from weathered exposures of the members. 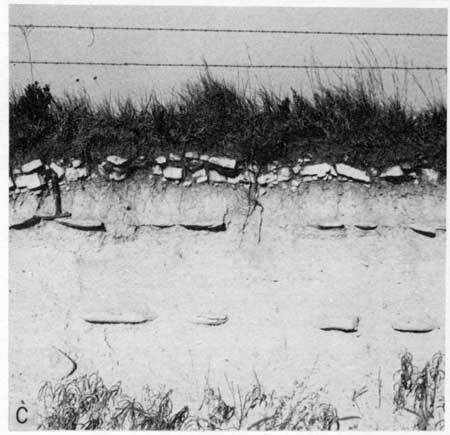 The Fencepost horizon of Logan (1897, p. 217) comprises the uppermost unit in his limestone group and lies 14 to 24.5 feet above his Inoceramus horizon. First called Downs limestone by Cragin (1896, p. 50) this unit is known today as the Fencepost limestone bed and forms the topmost unit of the Greenhorn Formation in Kansas. In Colorado, the Benton Group was divided by Gilbert (1896, p. 564) into three formations including (ascending) the Graneros Shale, Greenhorn Limestone, and Carlile Shale. This nomenclature has since become standard through most of the Great Plains region. Logan (1899, p. 84, 85) correlated his Bituminous shale with the Graneros Shale, and the remaining part of his Limestone group was correlated with Gilbert's Greenhorn Limestone. First formal use in Kansas of the three formational names proposed by Gilbert (1896) was that of Darton (1904, pl. 36). Because these formations, together with the overlying Niobrara Formation had long since been included in the Colorado Group of White (1878) the term "Benton Group" was no longer needed; accordingly, Benton Group lost official status in Kansas after 1920. The next modification of Greenhorn nomenclature in Kansas came in 1915 when Rubey and Bass (p. 47) formalized the term "Lincoln limestone member," and proposed the term "Jetmore chalk member" (p. 46) for the part of the formation that is characterized by 11 alternating thin beds of chalk and chalky shale occupying the interval from 20 to 40 feet below the top of the Greenhorn formation," with the Inoceramus limestone (Shellrock limestone bed of this report) forming the uppermost bed thereof. Rubey and Bass recognized a third member lying between the Lincoln and Jetmore Members, and a fourth member lying above the Jetmore. These were given the respective names "Hartland shale member" and "Pfeifer shale member" by Bass (1926, p. 32, 33). Hattin (ms., 1967) presented to members of the Geologic Names Committee of the State Geological Survey of Kansas a proposal for major nomenclatural and classificatory revision of the Greenhorn Limestone. Among the proposals was a recommendation for elevating the Greenhorn to the rank of group and including as a formation therein the Fairport unit which is ranked currently as a member of the Carlile Shale. The proposed changes have not been adopted by the Survey and are, therefore, not used in the present report despite my firm belief that the revision is eminently desirable. In the area lying between Ford (Loc. 8) and Lincoln (Loc. 24) counties the Graneros-Greenhorn contact is readily defined as the level at which predominantly noncalcareous gray silty clay shale of the Graneros underlies, with abrupt lithologic change and sharp stratigraphic contact, basal skeletal and/or chalky limestones of the Lincoln Member (Figs. 5,A,B; see also Hattin, 1965a, p. 11, 12). Paleontologic evidence demonstrates that this contact lies at an unconformity along which one of the standard Western Interior ammonite range zones is unrepresented (Hattin, 1965a, p. 44; 1968). From northern Pawnee County (Loc. 16, to Lincoln County (Loc. 24) the zone of Acanthoceras wyomingense (Reagan) is apparently absent and Greenhorn beds containing the Dunveganoceras pondi Haas? and Calycoceras? canitaurinum (Haas) fauna rests on Graneros strata containing Acanthoceras amphibolum Morrow, Inoceramus rutherfordi Warren, and Borissjakoceras reesidei Morrow. These Graneros strata were assigned to the Ostrea beloiti Assemblage Zone by Hattin (1965a, p. 40). In Ford (Loc. 8) and Hodgeman (Locs. 23, 30) counties, where the Greenhorn lies on Graneros beds of the Callistina lamarensis Assemblage Zone (Hattin, 1965a, p. 40), the O. beloiti Assemblage Zone is not represented, but the lower part of the Greenhorn contains faunal elements of the A. wyomingense Zone. Thus between Ford and Lincoln counties the unconformity separating the Graneros and Greenhorn appears to be diachronous (Hattin, 1968, p. 1087). Figure 5--Contacts between Greenhorn Limestone and adjacent strata. A) Graneros-Greenhorn contact (level of boy's feet) at Locality 3, sec. 18, T. 13 S., R. 12 W., Russell County. Note marked color contrast of two formations and bed of skeletal limestone at base of Greenhorn. B) Graneros-Greenhorn contact (Jim Cocke's hand) at Locality 8, sec. 5, T. 25 S., R. 24 W., Ford County. Carbonate rocks of Greenhorn lie in sharp contact on noncalcareous shale of Graneros. Thin, resistant bed of limestone at base of Greenhorn is packed with Ostrea beloiti. C) Upper few feet of Greenhorn Limestone at Locality 4, sec. 30, T. 8 S., R. 5 W., Cloud County. Weathered Fencepost limestone bed directly underlies upland surface. Note layers of chalky limestone concretions in shaly chalk below Fencepost bed. D) Fencepost limestone bed (Jim Cocke's hand) and lower few feet of Fairport Member, Carlile Shale, sec. 18, T. 13 S., R. 12 W., Russell County (Loc. 3). Note layers of chalky limestone concretions in shaly chalk above Fencepost bed. Compare photo with Figure 5,C. Despite the sharp change in fauna and lithology at most localities in the area discussed above, the upper part of the Graneros is locally calcareous, even approaching typical Lincoln lithology at a few places, for example at Locality 26 in Russell County, and the writer has suggested elsewhere that roughly the upper half of the Graneros was originally calcareous prior to weathering. At the time the break in sedimentation took place the environment which produced the sediments in the upper part of the Graneros was already changing toward that which produced chalky Greenhorn sediments. Despite local occurrences of calcareous or chalky shale in the upper part of the Graneros, the most practical, and long recognized, formational contact is at the unconformity, above which all strata are highly calcareous and at which there is a major faunal break. North of Lincoln County, evidence for the unconformity diminishes and the Graneros-Greenhorn contact commonly lies within a stratal sequence that is transitional between noncalcareous clay shale below and skeletal or chalky limestone-bearing shaly chalk above. As established in this report, the contact is placed at the base of the first conspicuous bed or beds, or zone of lenses, of skeletal or chalky limestone above which or within which the predominant lithology is shaly chalk or chalky shale containing beds or lenses of skeletal limestone. 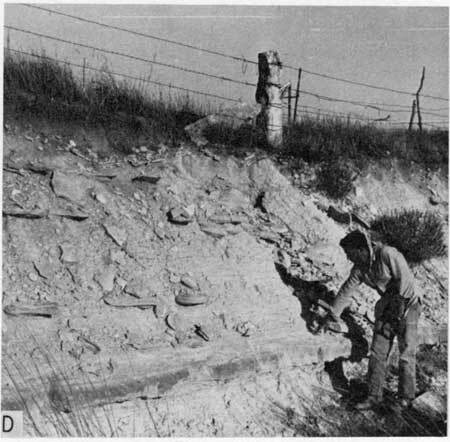 At Locality 21 in southern Mitchell County, the contact is placed at the base of a 0.55-foot-thick, hard skeletal limestone lying 1.2 feet above a thick bentonite marker bed ("X" bentonite of authors) in the Graneros that can be traced through much of central Kansas (Hattin, 1965a, pl. 1). The limestone bed is overlain by 10.9 feet of shaly chalk and chalky shale that contains little skeletal limestone and is thus unlike the lower half of the Lincoln in areas south of Lincoln County. The contact is apparently equivalent to that farther south, and may represent the Graneros-Greenhorn unconformity, but there is no fossil evidence for such a break. Farther east, at Locality 4, also in Mitchell County, a 1.95 foot-thick unit consisting of skeletal limestone, calcareous shale, and calcareous sandstone or sandy limestone lies in sharp contact with weathered Graneros shale and lies 1.7 feet above the "X" bentonite. This calcareous unit may be equivalent to the basal Greenhorn skeletal limestone at Locality 21 but is overlain by a thick (13.2 feet) interval of chalky shale and sandy calcareous shale that is nearly devoid of skeletal limestone except in the uppermost foot. The calcareous unit and overlying shale section contain Inoceramus prefragilis Stephenson, a fossil associated typically with Dunveganoceras pondi and younger Greenhorn assemblages. However, at this locality the 13.2-foot-thick shale interval is nearly lacking in skeletal limestones and is much less calcareous than usual for the lower part of the Lincoln in central Kansas, suggesting that in eastern Mitchell County this part of the section manifests a lateral change of facies. Accordingly, the Graneros-Lincoln contact is placed at the top of the shale interval involved in the facies change (see Plate 1). At Locality 47, less than 20 miles northeast of Locality 4, evidence of this facies change is more dramatic. The "X" bentonite is overlain in upward order by 1.2 feet of calcareous shale, 0.55 foot of unfossiliferous calcilutite, 4.3 feet of chalky shale and shaly chalk, the lower 3.0 feet of which contains very small skeletal limestone lenses, and 9.7 feet of shale the lower 5.8 feet of which is noncalcareous and the upper part of which grades upward from weakly calcareous shale to chalky shale. Except for the 3 feet of skeletal-limestone-bearing chalky shale and shaly chalk, none of the described section,is typical of the Lincoln Member but bears close resemblance to upper Graneros strata. Although the section from the calcilutite bed upward was included by me (Hattin, 1965a) in the Greenhorn, I now conclude that logical placement of the formational contact is at the top of the section just described. As thus defined for this locality the base of the Lincoln Member consists of a 0.15-foot-thick discontinuous bed of granular chalky limestone above which the remaining part of the exposed section, all assigned to the Lincoln, is dominated by highly calcareous rocks including numerous beds and lenses of skeletal or chalky limestone. At Locality 47 approximately 14.5 feet of strata that are apparently correlative with the lower part of the Lincoln at Localities south of Mitchell County are assigned to the Graneros Shale (see Plate 1). At Locality 1, in northwestern Mitchell County, the stratigraphic interval separating the "X" bentonite from typical skeletal limestones and shaly chalk of the Lincoln Member is 17.5 feet thick and consists mainly of weakly calcareous to calcareous shale that grades uniformly upward to chalky shale. A skeletal limestone bed 0.25 foot thick lies 0.12 foot above the "X" bentonite and a few very thin skeletal limestone lenses lie in the upper foot of this interval. The shale interval contains streaks of quartz silt, a layer of septarian concretions 3.3 feet below the top, and specimens of ammonites with preserved shell material. These three features are common in the upper part of the Graneros Shale farther to the southwest, especially in fresh exposures where the shale is calcareous, as at the overflow spillway of Wilson Dam, Russell County. The thick shale interval just described is lithogenetically related to the Graneros and has been so assigned by me (Hattin, 1968). Specimens of Acanthoceras wyomingense, presumably from the layer of septarian concretions just mentioned, suggest that at Locality 1 the unconformity separating Graneros and Greenhorn beds elsewhere, if present at all, lies much farther above the "X" bentonite than to the south. However, the base of the Lincoln at Locality 1, though rather well defined, lies within a sequence of lithologic gradation and lacks the sharpness seen in sections exposed in Russell, Ellis, Ellsworth and other counties lying to the southwest (see Plate 1). In Washington County (Loc. 6), the formational contact also lies in a gradational lithologic sequence and has been described previously by the writer (Hattin, 1965a, p. 11; 1968, p. 1085). Here the "X" bentonite is overlain by 4 feet of shale, the upper 1.8 feet of which is calcareous. These strata are overlain by chalky shale containing numerous very thin lenses of fine-grained skeletal limestone that marks the base of the Lincoln Member. The overlying 3.2 feet of shale are all chalky, containing numerous lenses of Inoceramus-rich skeletal limestone, followed upward by a bed of chalky limestone. Evidence of unconformity is totally lacking at this exposure. At Locality 12, Kearny County, the Graneros-Lincoln transition is similar to that at Locality 6. The "X" bentonite is overlain by 9.8 feet of calcareous and chalky shale that are virtually devoid of skeletal limestone and are best assigned to the Graneros Shale. The base of the Lincoln is marked by a 0.08-foot-thick bed of chalky and skeletal limestone which marks the base of the continuously chalky, overlying succession of Greenhorn strata, consisting in the first 4.8 feet mostly of chalky shale but including two seams of bentonite and numerous thin to very thin lenses of brittle, gritty, laminated chalky limestone. Above this, and lying 14.7 feet above the "X" bentonite is a 2.55-foot-thick unit containing, in addition to shaly chalk and chalky limestone, several thin to very thin beds of hard, petroliferous, skeletal limestone. The sequence is gradational from the bentonite upward, and lacks evidence of the unconformity which is so prominent farther to the east in Ford (Fig. 5,B) and Hodgeman counties. In summary, the Graneros-Greenhorn contact is placed at the lowest bed or beds, or concentration of lenses, of skeletal or chalky limestone above which the section is continuously chalky and consists principally of shaly chalk through which are scattered numerous beds and lenses of chalky and skeletal limestone. Across much of central Kansas this contact is sharply defined and lies at an unconformity. In areas of lithologic transition between typical Graneros and typical Greenhorn lithology, designation of the contact is somewhat arbitrary, but the criteria outlined above serve well in distinguishing between the two formations. Since the work of Logan (1897) appeared, the top of the Fencepost limestone bed has been regarded as marking the contact between formations now called Greenhorn Limestone and Carlile Shale. This bed can be traced through all areas of Greenhorn outcrop in Kansas and is readily mapped owing to the good exposure and extensive quarrying operations in many areas. Statements have been made (Rubey and Bass, 1925, p. 49; Landes, 1930, p. 21; Moss, 1932, p. 26) and the implication made (Bass, 1926, p. 31) that the top of the Fencepost is coincident with a faunal change, and this belief has been used to support the placement there of the formational contact. This argument notwithstanding, the top of the Fencepost does not coincide with a lithogenetic boundary worthy of recognition as a formational contact. Furthermore, no significant paleontological change occurs at this stratigraphic position. Major elements of the Pfeifer fauna occur also in at least the lower few feet of the Fairport Member of the Carlile Shale. These forms are: Mytiloides labiatus (Schlotheim) var., Inoceramus cuvieri Sowerby, Collignoniceras woollgari (Mantell), Baculites cf. B. yokoyamai Tokunaga and Shizimu, and Pseudoperna bentonensis (Logan). It seems obvious that the contact as presently defined cannot (and should not) be defended on paleontological grounds. Lithology of the upper part of the Pfeifer and lower part of the Fairport are essentially identical (Fig. 5,C,D). Soft-weathering shaly chalk both above and below the Fencepost contains numerous layers of concretionary chalky limestone occurring mostly as oblate spheroids. 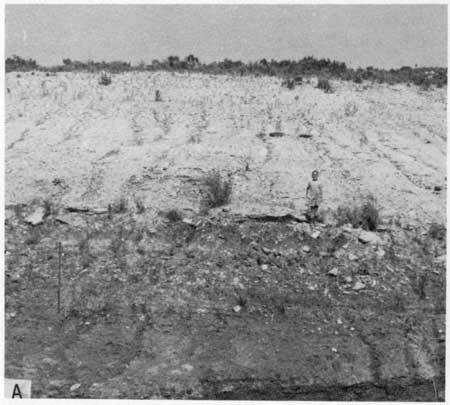 In fact, concretionary masses of chalky limestone characterize the entire interval between the uppermost of three hard limestone beds in the Jetmore (marker bed JT-12 of this report) and a widespread chalky limestone bed 0.45 to 0.6 foot thick that lies 4 to 6 feet above the Fencepost bed in central Kansas and is Fairport marker bed no. 2 of Hattin (1962, p. 44). Although a few concretions occur above this bed, such structures are lacking in Hamilton and Washington counties and are uncommon above the bed at most localities lying in between. Lithologic homogeneity of beds above and below the Fencepost bed dictates change in definition of the Greenhorn- Fairport contact so as to include the 4- to 6-foot thick concretion-bearing shaly chalk that rests on the Fencepost, together with the overlying chalky limestone bed. This chalky limestone directly underlies the margin of upland surfaces in many places (Fig. 4,C) and is the uppermost bed exposed in many roadcuts that expose the Pfeifer Member. The bed is also well exposed in cut banks along streams, and is better exposed than the Fencepost in many abandoned post-rock quarries, for example in SE sec. 3, T. 20 S., R. 22 W., Ness County and NE sec. 27, T. 15 S., R. 18 W., Ellis County. In a few areas such as Hamilton and Washington counties, where I have not observed concretions above the Fencepost bed, the contact is appropriately placed at the top of the Fencepost, below which the section does contain concretions. Thus, the formational boundary would no longer be coincident with a single marker bed but be based strictly on lithogenetic differences in character of the rock section. Despite the need for redefinition of this contact, for purposes of the present report the Greenhorn-Fairport contact is defined as the top of the Fencepost limestone bed. Placed on web June 5, 2010; originally published May 1975.